Ashira was born in the great elven city of Cedra, in the center of the large Cedralien forest near the west coast of the mainland. Orphaned after the city's destruction in 1038 at the young age of five, she was taken in by Tristan Katari, and his wife Myra. She lived in the Ariko village with them for the remainder of her early years. Always close to her 'brother' Talin, she was quick to join him on his journey to the distant continent of Arsalun. 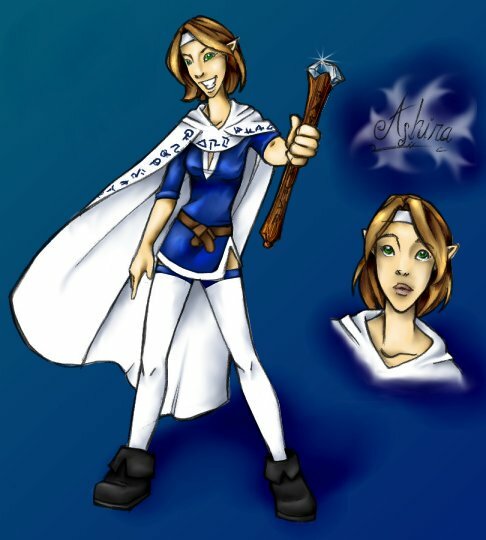 Character art by Tristyn, colored by Sarah Pinansky.